The Black Box Professional Technician's Kit is made for telephony communications systems and punch down applications. When working high up on those telephone poles, no one wants to be fumbling around with multiple gadgets and second-guessing their next move. 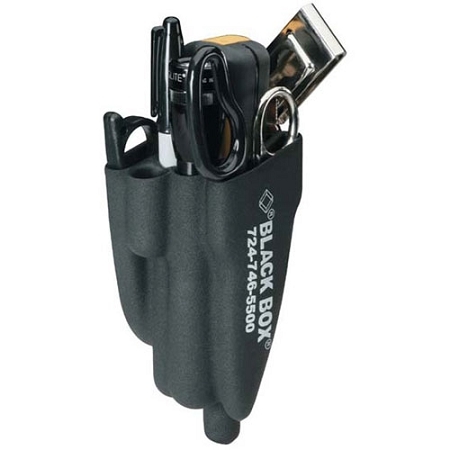 That’s why this BlackBox tool kit is designed like a holster—able to be clipped onto your belt for easy access, as well as offering pockets for other tools and extra punch-down blades. The punch-down tool itself features finger grips and non-slip cushioned sides for a firm hold while working. In addition to this, a multi-purpose cutter and stripper tool, ergonomically designed serrated scissors, and a flash light are all included in the Black Box Professional Technician's Kit. 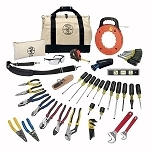 For a full list of all of the tools inside this kit, please click the "Specifications" tab.